For other uses, see Into the West (disambiguation). 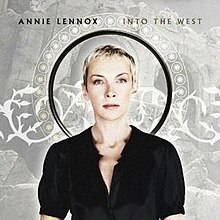 "Into the West" is a song performed by Annie Lennox, and the end-credit song of the 2003 film The Lord of the Rings: The Return of the King. It is written by Lennox, Return of the King producer and co-writer Fran Walsh, and composed and co-written by the film's composer Howard Shore. The song plays in full during the closing credits of Return of the King, although instrumental music from the song (which forms the theme of the Grey Havens) plays at other points during the film itself. (2003) "A Thousand Beautiful Things"
The song was later covered by New Zealand singers Yulia Townsend and Will Martin and American singer Peter Hollens. In 2014, German a cappella Metal band van Canto performed a cover on their fifth studio album, Dawn of the Brave. The song was conceived as a bittersweet Elvish lament sung by Galadriel for those who have sailed across the Sundering Sea. Several phrases from the song are taken from the last chapter of The Return of the King. It replaced an earlier song called Frodo's Song (which exists only in mock-up form) and another song featuring Annie's vocals called "Use Well the Days." The melody of the song is one of the musical themes used in the music written for the film, representing the Grey Havens, and the land of Valinor that lies beyond. It is used subtly when Gandalf describes the vision of Valinor to Pippin in Minas Tirith, and later triumphantly as Sam carries Frodo up Mount Doom. It returns in cellos and humming voices during the Grey Havens' scenes. The song itself soon follows, with a prominent guitar solo that opens and closes it and continues to accompany the song throughout, and a heartbeat-like motif played by bodhrán drums underneath. In the commentaries and documentaries accompanying the extended DVD edition of the film, director Peter Jackson explains that the song wasn't inspired by Frodo, but by the premature death from cancer of young New Zealand filmmaker Cameron Duncan, whose work had impressed Jackson and his team. The first public performance of the song was at Duncan's funeral. The song has five different versions, in addition to the version used in Return of the King (with the orchestral ending). Promos were made available in late November 2003. The song won the Oscar for Best Original Song at the 76th Academy Awards, one of Return of the King's eleven wins. Lennox also performed the song live at the ceremony; coincidentally, Lennox's performance was one of several introduced by Liv Tyler, who appeared as Arwen in the film. ^ "Van Canto: 'Dawn Of The Brave' Album Preview". Blabbermouth.net. 16 January 2014. Retrieved 16 February 2014. ^ Peter Jackson, Fran Walsh and Philippa Boyens (2004). Director/Writers' Special Extended Edition commentary (DVD). New Line Cinema. ^ Marsh, Stefanie (2005-02-15). "Oldies take gold at the Grammys". The Times. Retrieved 2010-01-04.